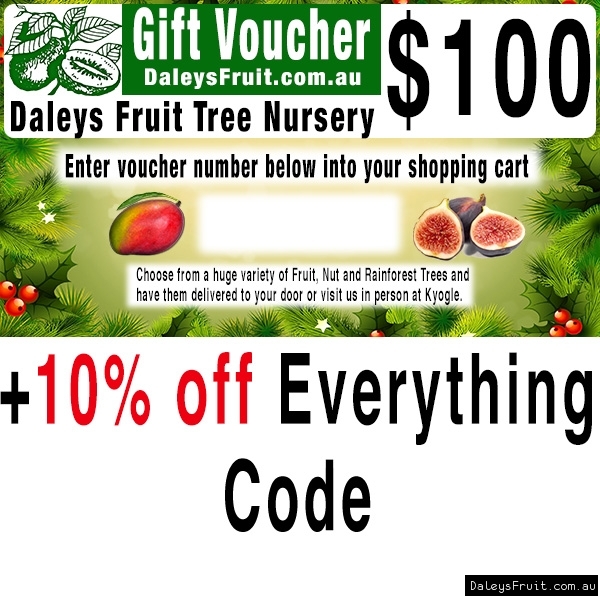 When purchasing this $100 Gift Voucher it also includes a 10% OFF discount code included in the email that can be used From 27th December 2018 to February of 2019. This is the perfect gift for all fruit lovers or even yourself. The benefit of this voucher is it can be used in-store by quoting the 10% off code or by entering the 10% off code online. Add to cart along with any other plants you may wish to buy or simply by itself. Then enter your postcode and address information as per normal. Vouchers are sent to your email address ( not your friends ) and you then have the option to print it out or forward the email with your own custom email to your friend. * only available close to Christmas. Please click Add to Cart below. The voucher is then emailed to you (Not the recipient) as a high quality image inside the email along with a separate email with your tax invoice. You then forward the voucher email and modify the subject and body of the email with your own personal message and send it to your recipient at a moment that suits you like their Birthday for example. You could also print out the voucher and give it to them in person.